Our “In Partnership” series continues with BNY Mellon hosting an event on 17th April 2018. We will explore the topic of 2018: The Time for Regulatory Data Platforms. If 2017 was about the rush to MIFDII regulatory compliance, 2018 is the year to start looking at RegTech solving your end-to-end regulatory compliance needs. Learn why your ongoing needs to manage topics such as Regulatory Change, Monitoring & Surveillance, CASS, Senior Managers Certification Regime, Risk Intelligence and more cannot be solved by buying a set of solutions designed for just one regulatory problem. 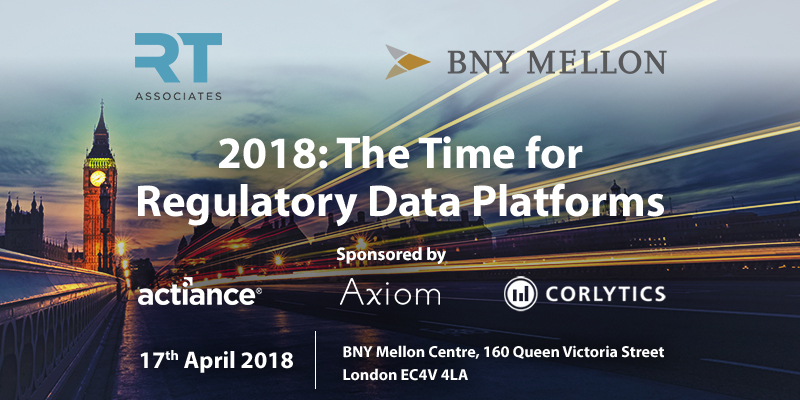 At 60 attendees, the intimate event will be a great opportunity for RegTech solutions providers to interact with BNY Mellon clients, representatives from pensions funds, foundations and sovereign wealth funds. Asset managers, banks, insurance companies and wealth managers (e.g. Blackrock, Standard Life, Goldman Sachs Asset Management, Henderson Global Investors) are also amongst attendees.